Many of us avoided determination of an optimal contact strategy by simply taking a hatchet to customer acquisition marketing, helping us improve profit in the short-term. 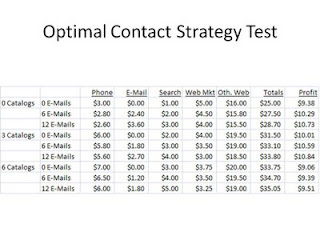 Rest assured that there is a lot of profit to be had by creating tests that identify an optimal contact strategy. So much of the work I do with clients is in this realm. We design a test that spans catalog marketing and e-mail marketing --- testing different combinations of catalogs and e-mails. Most of the tests are conducted on a quarterly basis. There is a general fear of withholding marketing from customers for more than three months, so we generally stay away from longer-term testing. That being said, all of the fascinating findings are identified in longer-term tests. I learned that lesson back at Lands' End, in 1993-1994 when we conducted holdout tests that spanned a twelve-month period of time. Customer behavior really changes when the tests are that long. In the test illustrated above, three catalog strategies (0, 3, 6) were tested against three e-mail strategies (0, 6, 12). Pay close attention to the results. The control group --- 6 catalogs, 12 e-mails, generated $35.05 demand and $9.51 profit. No marketing at all --- 0 catalogs, 0 e-mails, generated $25.00 demand and $9.38 profit. In other words, among the housefile customers tested here, it is just as profitable to do no marketing as it is to execute eighteen campaigns across three months. Nobody in our industry wants to hear that news. And yet, I see this over and over again in the Multichannel Forensics projects I analyze. In this case, the organic percentage is reasonably high ... ($25.00 / $35.05) = 71%. 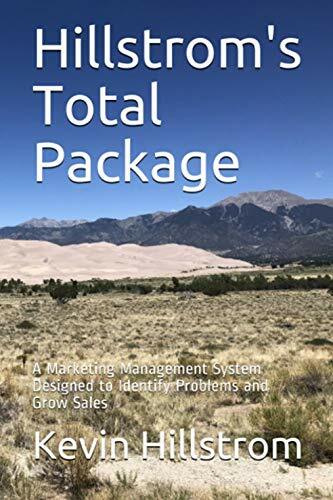 Seventy-one percent of the sales volume happens without catalog and e-mail marketing. The most profitable tested strategy is 3 catalogs and 12 e-mails, yielding $33.80 demand and $10.84 profit. This is the kind of testing that all of us must execute this fall. Our job is to design and execute the tests in Fall 2009, so that we can greatly improve profitability in 2010. 2) This cant be a one size fits all thing - some customers require more, others less. You need to stratify by segment or better yet, utilize individual level model scores. If you have the file size, scoring each contact opportunity using the uplift estimate (none, catalog, email, both) is the best way of all. This is more of a question rather a comment....do you look at this as a segment strategy rather an overall one? I think that it is a given that high RFM scores will have high organic %s, but are there any differences on the organic %s between a 1X customer score versus a 2X plus, etc...? Anonymous #1 --- yes, your comments are correct. Anonymous #2 --- yes, this is best implemented as a segment strategy, and there are differences in the organic percentages between different "RFM" segements, if you will.